The first thing that needs to be done is follow the directions on your cake box, and bake the cake. Let the cake cool and then turn it into crumbs. The fastest way to do this is with a food processor. Once all of your cake is ground up into crumbs add to a bowl and mix in about half of your icing (about 1/2-2/3 cup). Now your cake should be a moist dough, test it by rolling up a ball and seeing if it holds. With the plastic Easter egg, use it as a guide mold and fill it with the cake pop dough. Then use your hands and smooth it out. When using a plastic egg as a mold you will get about 15 cake pops. If you do not feel like doing this method, they look just as cute as balls. The next step is to coat the cake pops with candy melts. Follow the directions on the candy melt bag to melt the candies. I used the method of placing the candy melts in a bowl then placing that bowl on a pot with a little bit of simmering water. I like this method because it keeps the candies from hardening. 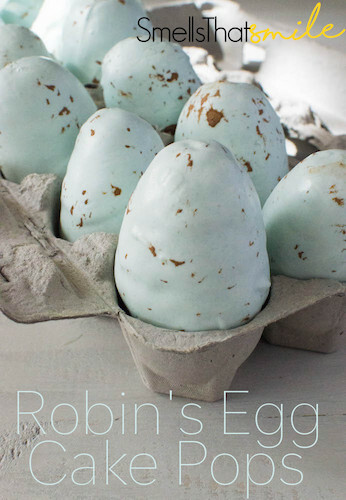 Once the candies are melted, we want to give them that light blue robins egg. So slowly add the blue food coloring, I used Wilton's Sky Blue. Keep slowly adding the dye until it's the right shade of blue. If your candy melts are thick or thicken, I added a little crisco to smooth it out. When your candy melts are ready, take a tooth pick and dunk your eggs into the melts. They take a few minutes to dry and harden, I placed the sticks in the holes of a colander. Once your eggs outer shell has harden, it's time to paint on the little brown speckles. To create the edible brown paint, mix together cocoa powder and vanilla extract. Then add a little water at a time until it had that paint thickness. With the paint brush, dip it in the mixture and lightly blot the egg with the brush to give it that speckle effect. Once finished and dried, I placed them in an egg crate so I can easily travel with them and it gives a cute touch.